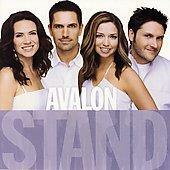 I was excited to hear that Avalon just came out with their new CD, Stand, in January 2006. But, my enthusiasm fell when I heard the album. I was pretty disappointed and I’m glad that I didn’t buy it. I think their best ones were In a Different Light, A Maze of Grace, and Oxygen. I think Oxygen is when they began their decline. However, there was one song in the CD that I really liked. It was the last song (Imagine that! ), Where Joy and Sorrow Meet or just Joy and Sorrow. It has a great piano part and I wanted to play it. Of course, since the album was just released, there are no free chords online or for-pay sheet music available. I guess, I’ll be the first one in the world to make public any type of music transcription of this song! Yay, I’m famous! Enjoy! This entry was posted on Sunday, March 5th, 2006 at 4:28 pm	and is filed under Chords, Music. You can follow any responses to this entry through the RSS 2.0 feed. You can leave a response, or trackback from your own site. I would have to disagree with your assessment of Avalon’s newest CD. I have been a fan since the group first appeared on the scene. To me, their music gets better and better. In fact, I have purchased a number of accompaniment CDs for use at church. I have to agree with Mimi. Stand has got to be one of their best, and most spiritual offerings yet. Songs like Orphans of God, We Will Stand, and the one transcribed above are golden! Although I have always enjoyed this group I thought their earlier work was characterized by an attempt to sound like the foursome just stepped out of a club (although I only started listening at A Maze of Grace). Each CD since then has slowly matured into a more spirit filled endeavour. It is unfortunate that Jody must leave the group due to a medical issue. I’m not sure if they will ever be the same.